Single manual William de Blaise harpsichord for hire. The harpsichord consists of 8, 4, and harp. 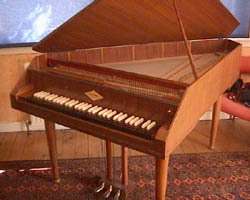 The harpsichord also has other de Blaise innovations which allow the player to modify the volume of the stops. The harpsichord has recently been fully restored by Robert Morley & Sons, resulting in an instrument with stable tuning and a marvellous tone. It is tuned to equal temperament, and the pitch is at A=440. Each hire is costed on an individual basis, our minimum hire charge is £100, which is inclusive of delivery within a radius of 30 miles.